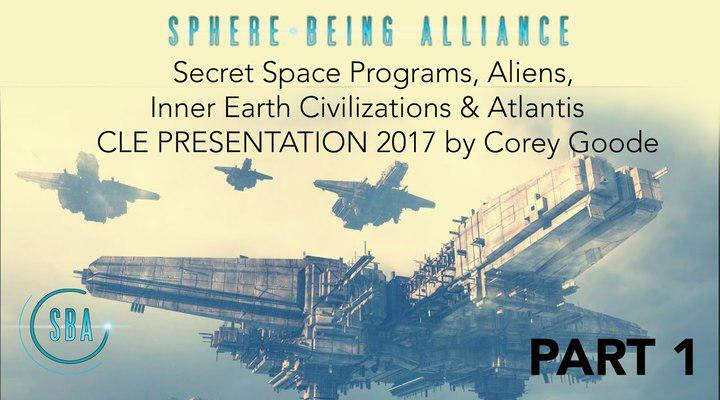 During the Conscious Life Expo 2017 in LA, Corey Goode revealed fascinating details about secret space programs, Alien life and Inner Earth civilizations. Corey Goode identifies himself as an intuitive empath (IE). According to the Sphere Being Alliance, Corey Goode was recruited through one of the MILAB programs at the young age of six. (MILAB is a term coined for the military abduction of a person that indoctrinates and trains them for any number of military black ops programs.) Goode trained and served in the MILAB program from 1976-1986/87. Toward the end of his time at MILAB he was assigned to fill an IE support role for a rotating Earth Delegate Seat (shared by secret earth government groups) in a “human-type” ET SuperFederation Council. During the Conscious Life Expo 2017 in LA, Goode spoke about fascinating details concerning Alien life, Alien contact, inner-Earth civilization and forbidden knowledge in general. Corey Goode isn’t the only one who has spoken out about the existence of a fully operational secret space program. In addition to the above, a former Marine claims to have even WORKED on Mars. The retired officer only known as Captain Kaye (pseudonym), said that not only have humans made it to Mars in the past, we have developed a secret space program and flotilla that operates in space. According to the former Marine, he was posted on the red planet for years and his mission was to protect the five human colonies from indigenous life forms on Mars. According to Captain Kaye, not only did he spend years on Mars, but he also served aboard a giant space carrier for three years. Goode isn’t the only one who believes there are civilizations inhabiting lower parts of Earth’s crust. In a new interview by Coast to Coast am, author and researchers David Wilcock stated that an alliance of ancient civilizations is living inside the planet. These ancient civilizations have been calling the inner Earth their home for long periods of time and they are about the reveal themselves to the world. Wilcock explained that during the formation of all watery planets in the universe (and according to latest studies by NASA there are quite a few) hollow cavities are formed below the surface of the crust, with their very own biome with bacteria that is capable of giving off natural light.